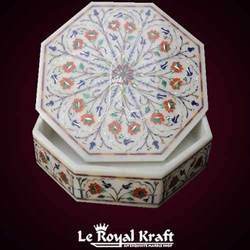 marble jewellery tile box available in each sizes. With our enthusiastic employees and most up-to-date machines, we are engaged in offering quality assured collection of Stone Jewelry Box. We have hired a special team of quality analysts who check and recheck each and every product before its delivery. These products are known for its supreme finish and attractive designs. What is Inlay Art One of the most attractive work of art that comes from marble is"Marble Inlay" work. It is the same work that adorns the Taj Mahal and other Mughal monuments. 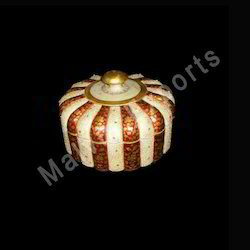 Rajasthani Handicrafted marble Jewelry Box with real gold and meenakari work.